What an exciting first day we have had at Machaneh Yavneh! The madrichim (counselors), started with an early wake-up call to do some final bunk prep. The gates then opened and we all had a great time settling the chanichim (campers) into their tzrifim (bunks). We played a bunch of team-building and name games to help everyone get acclimated, then went on down to the chadar ochel (dining hall) for a scrumptious pizza lunch. 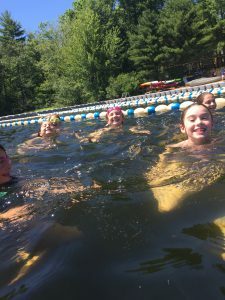 Next was shaat menucha (rest hour), and after that we had a rotation of swim lesson placements, games including gaga and hula-hut dodgeball (an instant favorite! ), and opening bunk meetings to go over ground rules for the month. Some more free time to get familiarized followed, along with time to shower. A great schnitzel meal followed for dinner- even the Israelis at camp were impressed! We finished the night with an activity for the entire aydah (unit). With over 100 chanichim and madrichim in Kfirim, this was no easy feat! 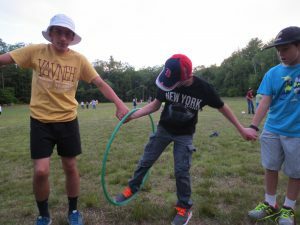 With six different stations, the chanichim were divided up by birthday month and rotated around to creative, silly, and fun-filled games to help them learn more about one another and get ready for a wonderful kayitz (summer). 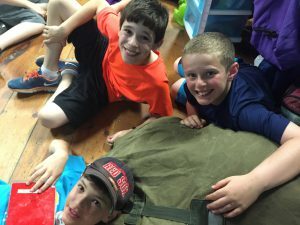 Each one of the members of Kfirim brings something special to the aydah and we are so excited for the summer!